Another app is born. 🙂 This one has the potentially grandiose title “Everywhere“. But in fact that is exactly what it’s about! 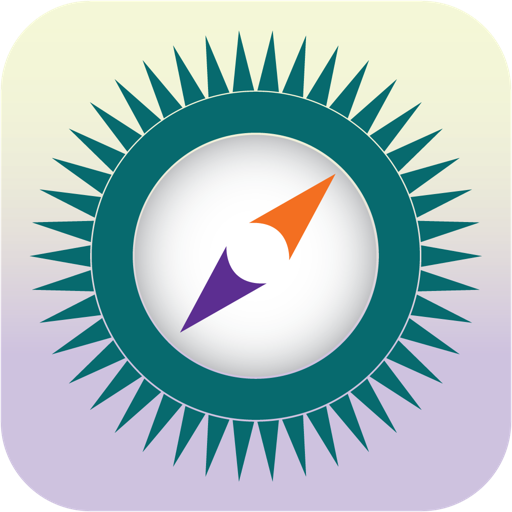 This app keeps you in touch with the world. You can create a list of any locations that interest you – for example, where-ever your family, friends, colleagues and business associates live and work. And as an additional tool to help you work out the crazy timezones of this world, it offers a fantastic scrolling full-screen visual zone comparison table. So no longer any need to accidentally call your uncle when it’s 3am in his part of the world. And along with the time is a color-coded time-status that indicates, again at a glance, whether each location is in normal working hours, normal waking hours, nighttime hours, or public holiday hours. In fact this app is not entirely a new creation – it has heritage (and pedigree! ), being a re-incarnation of a much older Windows app called ZoneTrekker, which had the notable achievement of having had the Pentagon, no less, purchase a site-wide multi-user license for it. That harks back to the days when I made my living as a Windows desktop app developer. But with such an illustrious past, I felt it was time to re-birth the concept as a mobile app – so now here it is as a universal iOS app – and in fact much nicer than the original in a number of ways! 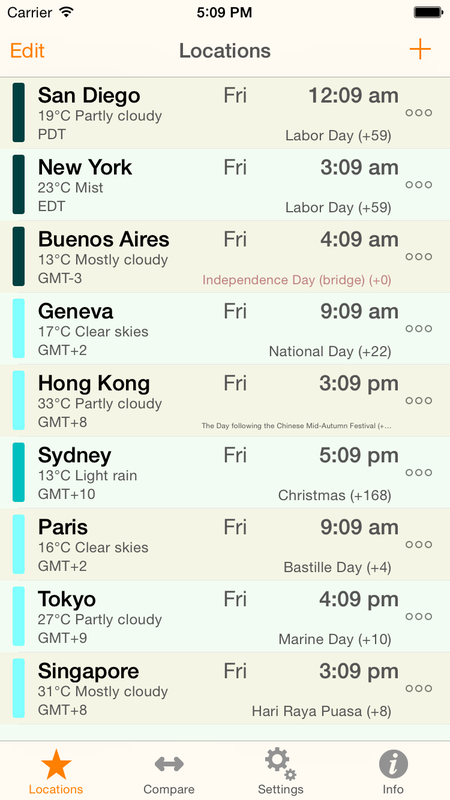 To add a location, tap on the + button, and type in a city name. To delete a location, tap on the Edit button, and then on the – button at the left of the cell. To re-order locations, tap on the Edit button, and then drag entries into the desired order using the drag-bars on the right of each cell. To see a list of the current and next year’s holidays for a given location, tap on the ellipsis on the right hand side of the cell. 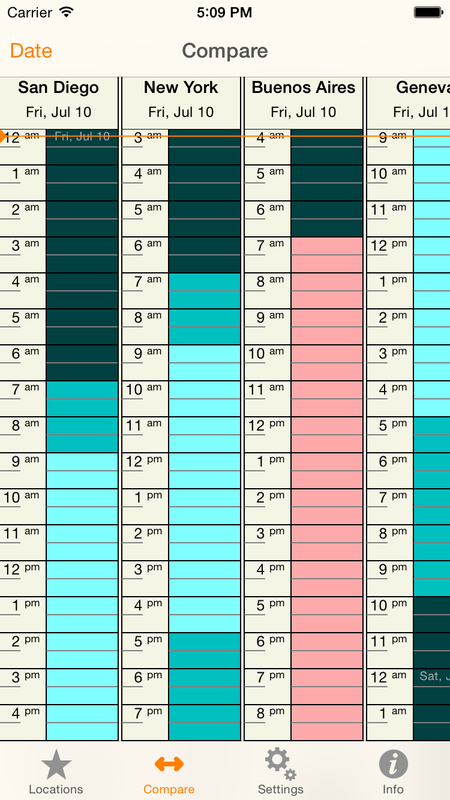 Note that public holidays are shown with Pink, whereas “observances” which are not usually taken as public holidays are shown with Dark Cyan. So there is is! Now what are you waiting for? Go and get it!